With seemingly endless pink dawns, clear skies and watercolour sunsets, this autumn has been truly glorious. Little wonder it had me dreaming of a few days at a dog-friendly hotel by the sea. So my boyfriend Ben and I decided to make the classic UK staycationers’ pilgrimage to the wilds of Cornwall. 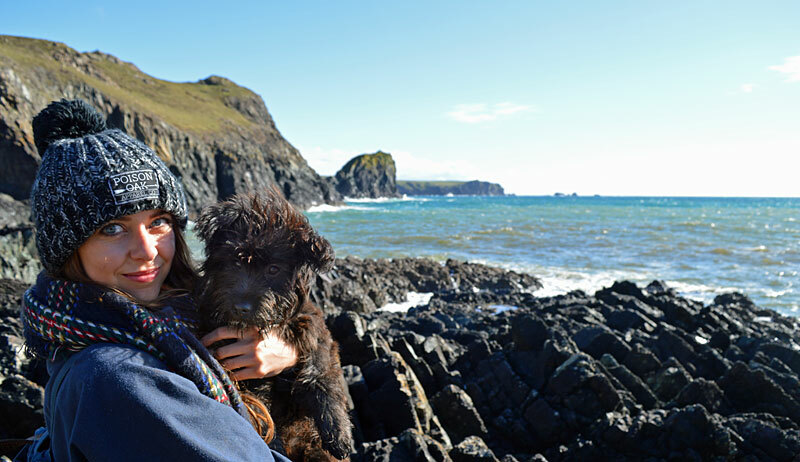 With our little rescue dog Bea in tow, we drove southwest in search of empty beaches, bracing sea air and cosy log fires. The Rosevine fit the bill perfectly. 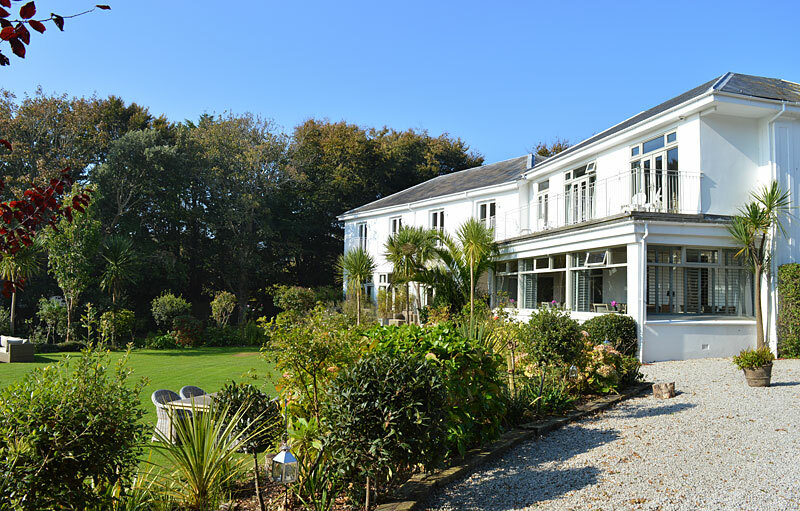 A fantastic little apart-hotel overlooking beautiful Porthcurnick Beach, it welcomes kids, couples and dogs alike. 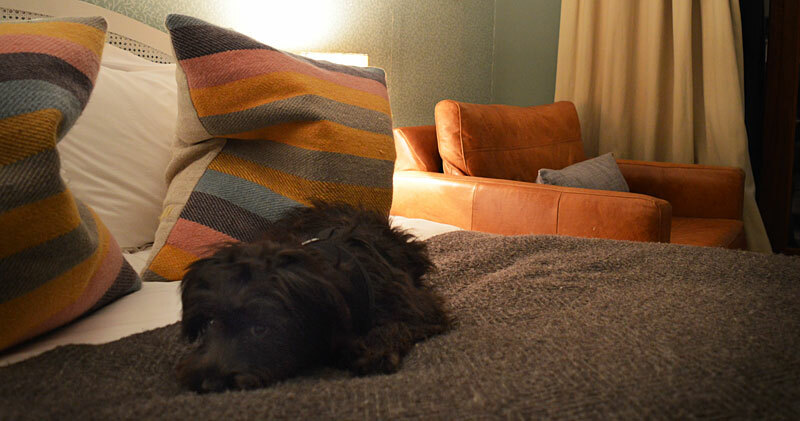 We stayed in their annexe building, where the Slate Rooms are perfect for four-legged friends. 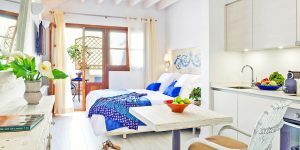 Each is airy and spacious, with wood floors, a big bed and direct access to a small terrace/garden area. 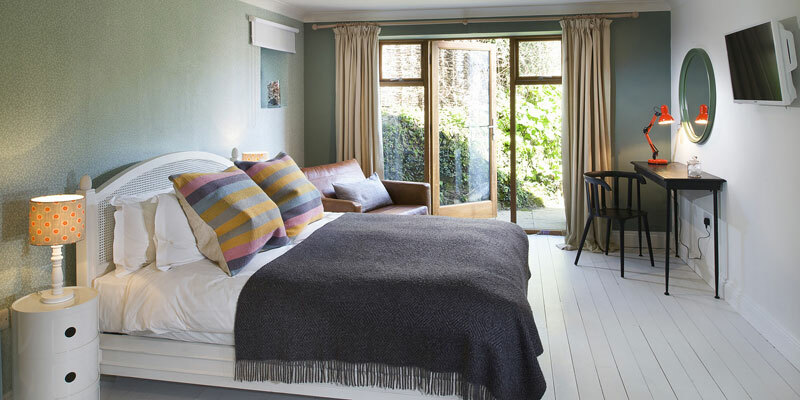 Our room ensured the three of us quickly settled in to Cornish life. Come dusk, we left Bea snoozing contentedly and strolled over to the relaxed hotel restaurant. 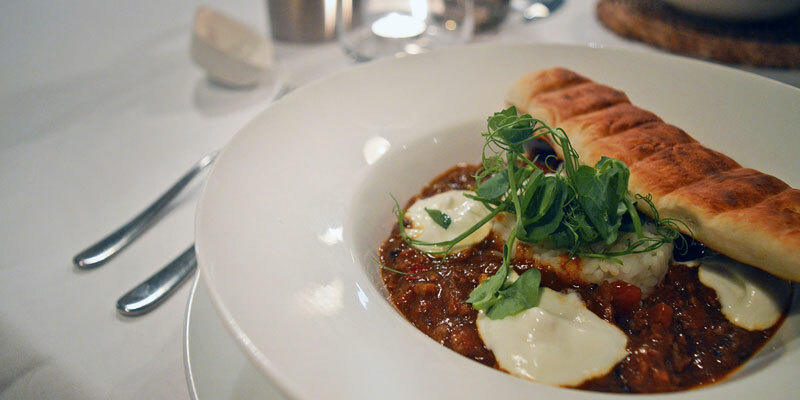 Feasting on Cornish chowder, clotted-cream peanut parfait and crisp white wine, the city’s stresses soon melted away. Come morning we were greeted by an icy blue sky and the distant roar of Atlantic waves. 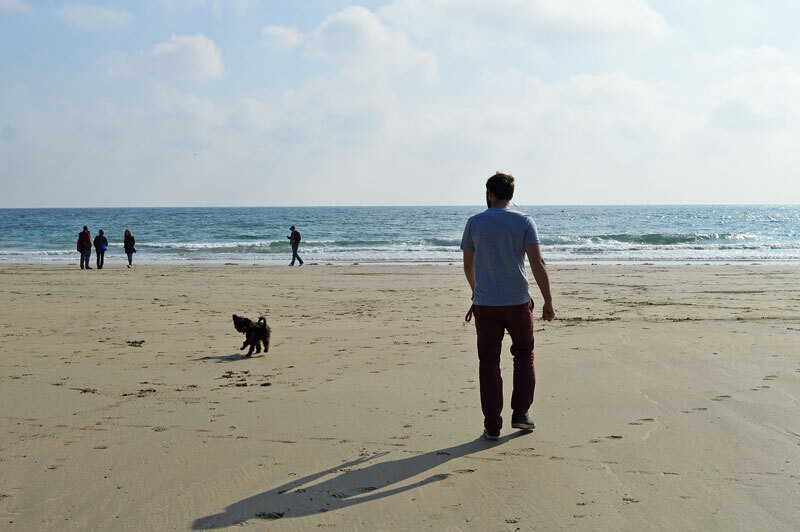 We couldn’t resist a pre-breakfast walk along the beach – not a problem when it’s just 5 minutes from your room (and dog-friendly all year round). 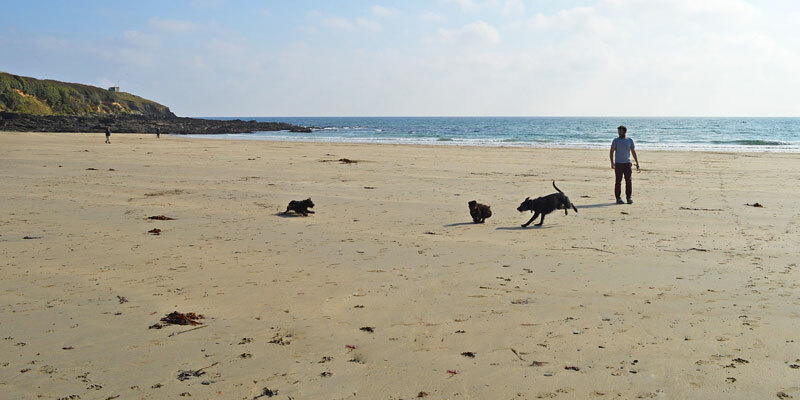 Having never been to the coast before, Bea was beside herself as she felt the sand under her paws. 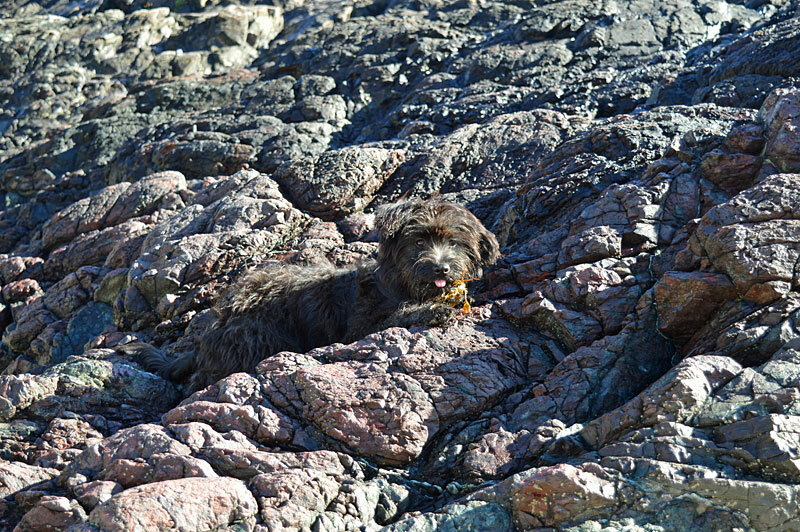 Leaping and skipping up and down the shoreline, she grabbed treasured seaweed and introduced herself to every other dog in sight. Had we had more time, we’d have stayed for lunch at The Hidden Hut beach café, on the hill behind the sand. 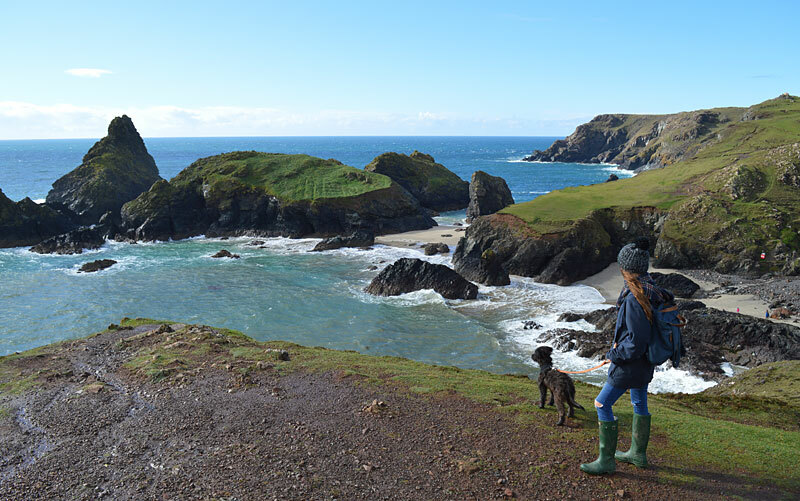 As we travelled further down the coast, we were lucky enough to spend a glorious afternoon at Kynance Cove. 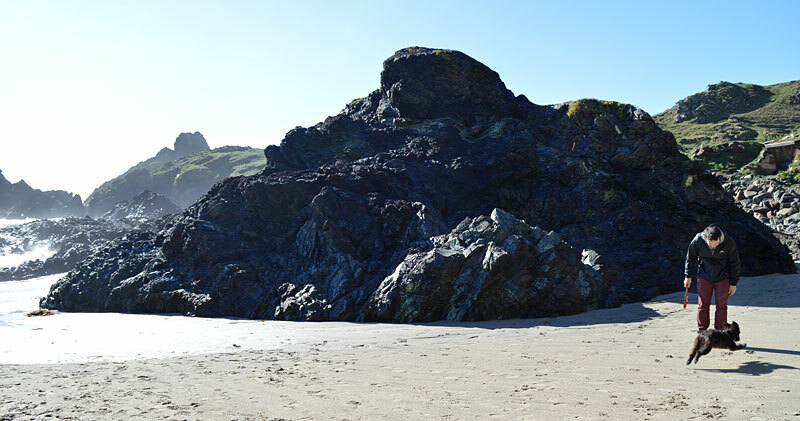 We’d long wanted to visit this dramatic landscape, where great rocks rise from the sands, guarding the shore from crashing waves. After driving through relentless rain to reach it, we couldn’t believe our luck when the clouds dissipated and the sun started to glisten on the open sea. Carving our way through the moorland, we were soon dwarfed by the cove’s rocky monoliths. Bea relished this exciting maze of rushing water and damp sand, with gliding birds overhead. 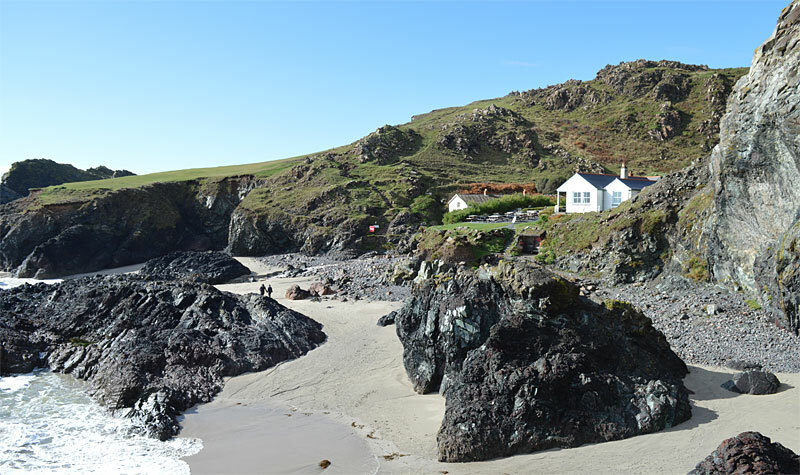 Refreshed by the Atlantic gales, we settled outside Kynance Cove’s homely clapboard café (open April-October) to refuel. We were rewarded with the largest, heartiest pasty we had ever seen. Steaming cups of tea in hand, we sat back to gaze at views that simply couldn’t have been beaten. 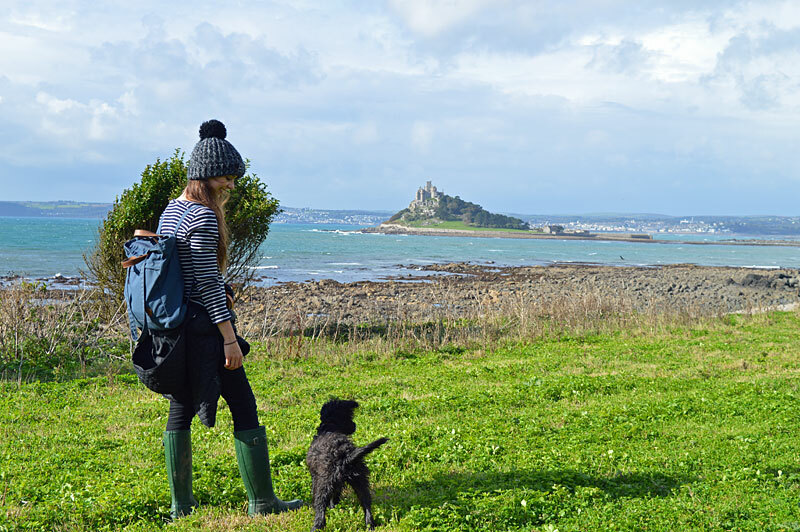 Next we ventured to iconic St Michael’s Mount. Strolling across the causeway at low tide was glorious, but we found the island somewhat underwhelming. The house is understandably closed to dogs, but so are the manicured gardens, leaving little more than a few cobbled streets and a rather basic, seagull-plagued outdoor cafe for us to “enjoy”. It wasn’t long before we decided to retreat back to the mainland along the now rain-battered causeway. Much more sofa-dog than sea-dog, poor Bea huddled resolutely against the island wall, refusing to venture out into the turbulent wind and rain. Feeling her pain, we scooped her up in Ben’s coat and carried her back. Do I sound like a soft touch? Perhaps, but look at that little face! Once safely ensconced in a local café, Bea swiftly curled up and fell into a deep slumber, while we piled our Cornish scones high with clotted cream and oodles of raspberry jam. Evidence, if ever it was needed, that sometimes it’s better to be the one gazing at the beautiful house rather than the one living in it. On our final day, we rounded off our trip with a walk along the expansive curve of Praa Sands. 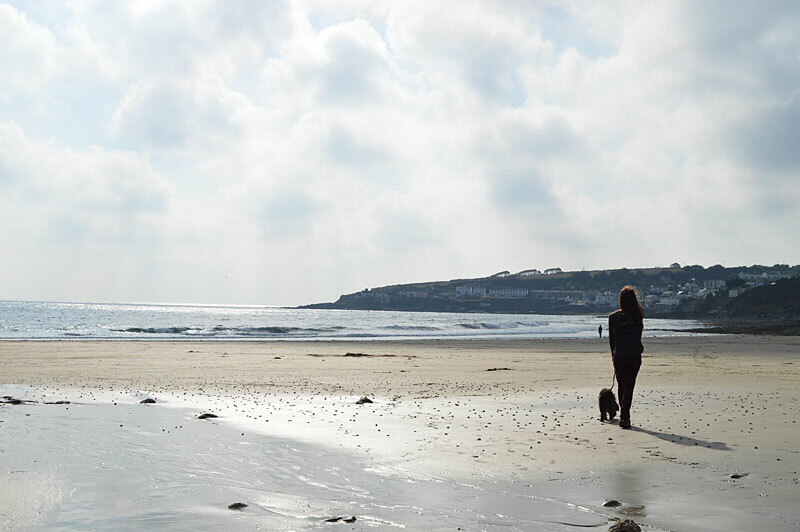 Warmed by the morning sun, we took a lazy breakfast at the super-chilled Sandbar café and soaked up the last of Cornwall’s enchanting views. 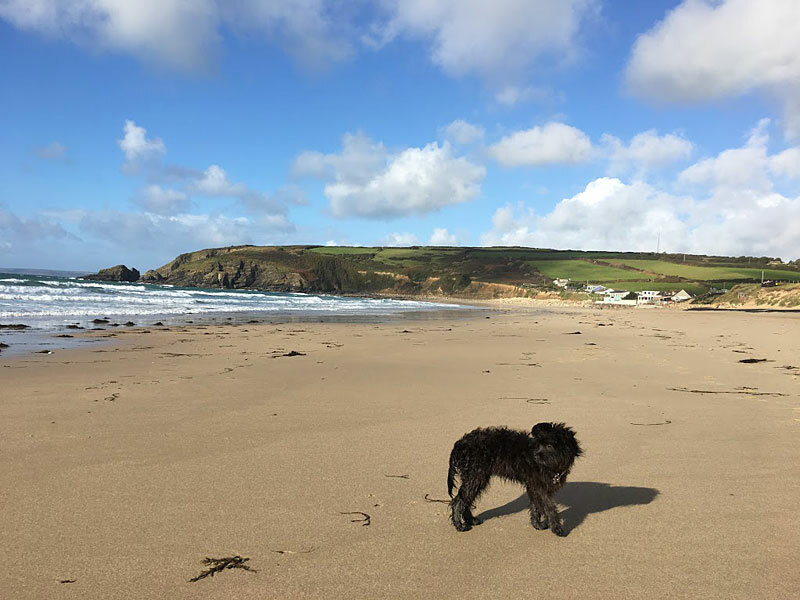 Bea was welcomed like family as we treated ourselves to enormous bacon sandwiches and plotted our move to Cornwall… the benchmark of a successful holiday. 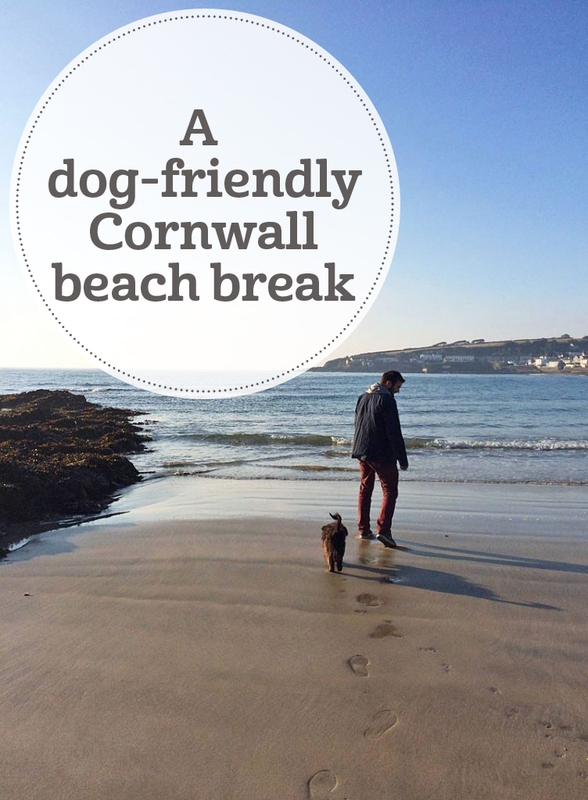 Check out our full collection of dog-friendly hotels and self-catering houses. Bea was found abandoned as a tiny puppy on the streets of Mostar, Bosnia. Thankfully, she, her mother and her siblings were rescued and taken into a foster home. 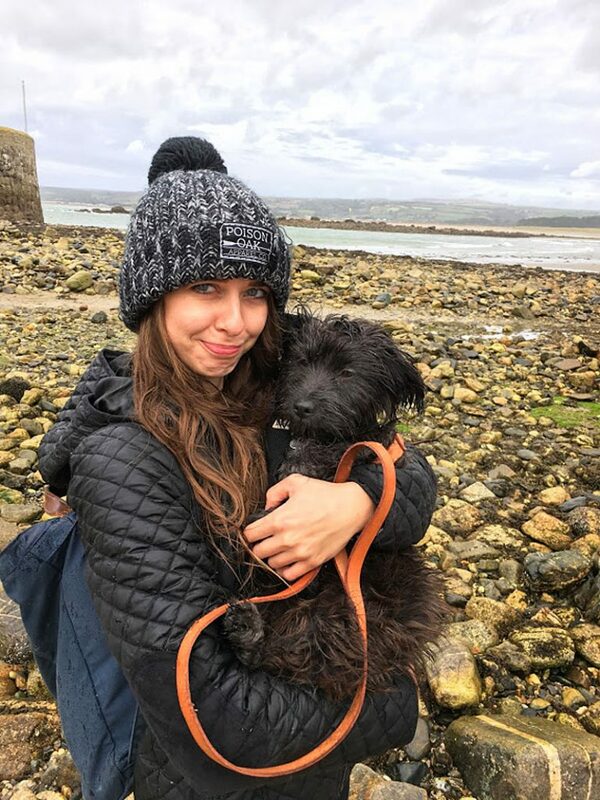 Soon afterwards, we were able to adopt her through the Wild at Heart Foundation, a UK-based charity which works tirelessly to reduce the world’s 600-million stray dog population. She is now 6 months old and lives a very comfortable life with us in Bristol. If you are interested in finding out more about the wonderful charities that helped Bea find her new home, please take a look at the following Instagram accounts: Wild at Heart Foundation & Animals We Care Mostar.